An international team of researchers used ancient DNA to reconstruct the first high-resolution genetic record of modern European lineages through time, observing both human DNA evolving in ‘real-time’ and the dramatic population changes that have taken place in Europe. 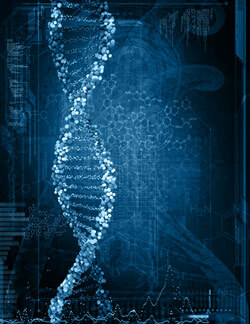 The research was performed at the University of Adelaide’s Australian Centre for Ancient DNA (ACAD). Researchers used DNA extracted from bone and teeth samples from prehistoric human skeletons to sequence a group of maternal genetic lineages that are now carried by up to 45% of Europeans. “This is the first high-resolution genetic record of these lineages through time, and it is fascinating that we can directly observe both human DNA evolving in ‘real-time’, and the dramatic population changes that have taken place in Europe,” says joint lead author Dr Wolfgang Haak of ACAD. “The record of this maternally inherited genetic group, called Haplogroup H, shows that the first farmers in Central Europe resulted from a wholesale cultural and genetic input via migration, beginning in Turkey and the Near East where farming originated and arriving in Germany around 7500 years ago,” says joint lead author Dr Paul Brotherton, formerly at ACAD and now at the University of Huddersfield, UK. “These well-dated ancient genetic sequences provide a unique opportunity to investigate the demographic history of Europe,” says Professor Cooper. 2 Comments on "Ancient DNA Reveals the First Detailed Genetic History of Modern Europe"
watch a movie thats almost banned from america called hidden colors. IF an advanced culture experienced global disturbances that crashed their society and were forced to relocate and begin at a lower level with knowledge that allowed rapid advance, they would then have resolved problems that led to warfare especially in a sparsely settled world. You might even call it Eden. Isolation would not have prepared them to confront violent incursions.